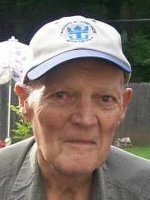 ALBANY – Edwin S. Nelson, 92, of McKownville, passed away on Tuesday, December 29, 2015 at St. Peter’s Hospital. Ed was born in Albany, the son of the late Oscar Nelson, an immigrant from Sweden, and Astrid Neilson Nelson, an immigrant from Denmark. He lived in the area all his life. As a teenager he caddied at Wolfert’s Roost, and then went to work for the New York Central Railroad. He then served in the U.S. Army Company C, 721st Railway Operating Battalion during World War II in Burma and India, and returned to work for New York Central after the war. He continued this work with the Penn Central Railroad and Conrail until his retirement with 45 years of service. Ed enjoyed boating and camping with his family on islands at Lake George and at Thousand Islands, areas that he referred to as “God’s Country.” He also was a craftsman, building his own home addition and helping restore his son’s old farmhouse, as well as serving as his own mechanic. He also enjoyed fishing, and a bit of golf, and in retirement, he and his wife enjoyed trailer camping in Florida each winter. Many remember him for making everyone laugh. Ed was predeceased by his beloved wife Jean Strube Nelson, and daughter Barbara Jean LaJeunesse. He is survived by his sons William E. Nelson of Dania Beach, FL, and Robert J. Nelson of Altamont; his brother Paul Nelson of Satellite Beach, FL; his sister in law Margaret Elliot of Utica; and his grandchildren Trevor E. Nelson and Rebecca C. Nelson. He was also loved by several nieces and great nieces and nephews. Funeral services will be held in the Hans Funeral Home, 1088 Western Ave., Albany, Monday evening at 6:00 pm. Relatives and friends are invited, and may call at the funeral home prior to the service from 3-6 pm. Interment will be held privately at a later date. The family suggests memorial contributions to the American Heart Association, 4 Atrium Dr #100, Albany, NY 12205. To leave a message of condolence for the family or obtain directions to the funeral home, please visit www.HansFuneralHome.com. Click her to view Ed’s resting place in Albany Rural Cemetery, Menands, New York 12204 (Section 210, Lot East 1/2 of 12, Grave 2). Bill…Rob….family….Diana and I share your loss..Ed was the greatest…still is…..leading the gang laughing. ..joking from a different place. The Nelson Family …. I am sorry for your loss.. I remember the church suppers and Edwin would drive his van and we all would go. Love you all… Amy Courter and family. We wish we could be there with you. Edwin was an unique guy and he will be missed. We are there in thought. Love to all! Bill, Rob and Family. We are so sorry for your loss of your Father. Ed was a very special and funny man he will be missed. Rob, My condolences to you and your family on the loss of your dad. Very sorry for your loss. My thoughts and prayers are with you. Rob, Bill and family ~ Please know that Jim and I will be thinking of you all today and wish we could be there to share in the memorial to your dad…he was truly a great man and he will be missed! We, the Maryland Smith family, were blessed to have Eddie in our lives and we have wonderful memories. You are all in our hearts and prayers. We are with you in spirit.